Default value. Pastes the entire contents of the cells. Pastes everything but border settings. Only sets the column widths to match. Only pastes the cell comments. Only sets the cell formatting options. 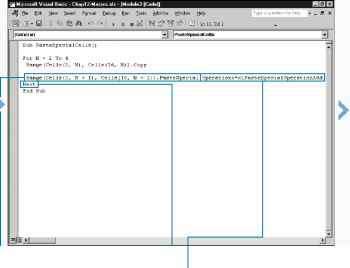 Pastes the formulas and number formats. Only pastes the cell values. Pastes the cell values and number formats. ^Q Type Range(Cells(3, N + 1), Cells(l6, N + 1)).PasteSpecial, replacing Cells(3, N + 1), Cells(16, N + 1) with the range where the copied cell values should be pasted. ■ The specified range of cells is copied and added to the new range of cells.